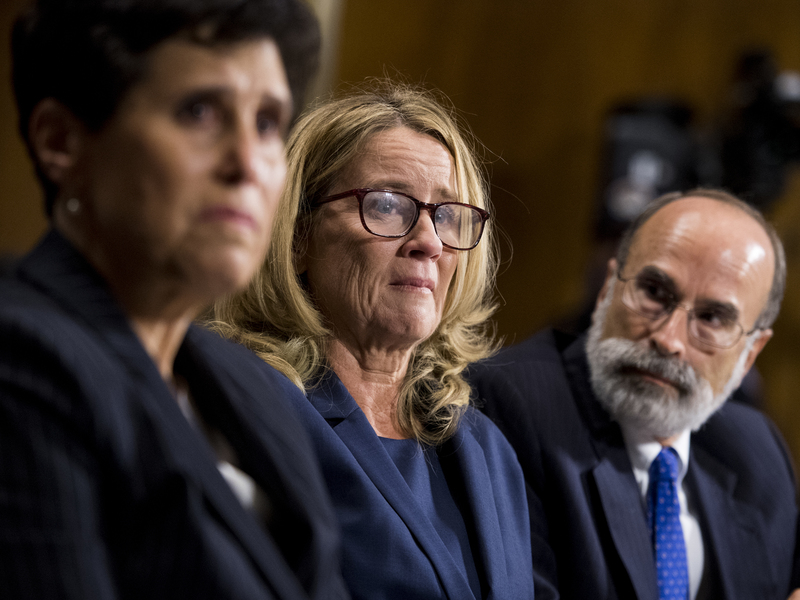 Christine Blasey Ford's lawyers say she isn't interested in publicity or a book deal. She is struggling to get her life back on track following her testimony in the Senate. She has had to move four times, she wrote last month. She has had to pay for a private security detail. She hasn't been able to return to her job as a professor at Palo Alto University. A spokeswoman for the school did not respond to a question about whether there was a timeline for Ford to return. Ford's accusation that Kavanaugh had assaulted her when the two were in high school — and Kavanaugh's emotional response — took place before the Senate Judiciary Committee on Sept. 27. Ford detailed the intimidation she was receiving then. "My family and I have been the target of constant harassment and death threats," she told the committee. "People have posted my personal information on the Internet. This has resulted in additional emails, calls, and threats. My family and I were forced to move out of our home. ... My family and I have been living in various secure locales, with guards." Although the spotlight has receded, the danger has not, Ford's lawyers say, but she is not interested in trying to turn her story into something that could make the experience lucrative. "Dr. Ford's current focus is solely on recovering from the experience and returning to her job responsibilities — not on writing a book," her lawyers said. During the course of her Senate testimony, two GoFundMe campaigns launched on her behalf raised more than $800,000. Heidi Feldman, a law professor at Georgetown University, set up one of the two GoFundMe pages for Ford, ultimately raising more than $200,000. Feldman told NPR she'd had no contact with Ford about the costs for her security detail. "My understanding from GoFundMe is that [she] has access to the money my campaign raised (I do not know if she has withdrawn it)," Feldman said in an email. "I have no information about whether or how she has used or plans to use it." A Slate article and the investigations arm of RealClearPolitics have both recently questioned what might happen to the money raised for Ford's benefit. Ford and her husband own real estate worth millions of dollars, RealClearInvestigations writer Paul Sperry pointed out, adding that they had recently begun the process of an expensive renovation of her California beach house. "It does make me a little uncomfortable to watch more than 13,000 people give money to an already-wealthy woman for unspecified expenses related to a sexual assault accusation when so many other survivors are trying to get by with far greater need and far less social, institutional, and financial support," wrote Slate's Christina Cauterucci. Ford's lawyers stressed that she continues to need protection. "Dr. Ford and her family have tremendous gratitude for the generous crowdfunded contributions they have received," her lawyers said. "These funds have been used exclusively for necessary costs of physical security and housing occasioned by coming forward about her sexual assault by Brett Kavanaugh." Ford's lawyers added that any unused funds would be donated to "organizations that support trauma survivors" but declined to say whether Ford had decided which organizations to support.